[bdring] just recently completed his absolutely fantastic NickelBot, which is a beautifully made unit that engraves small wooden discs with a laser like some kind of on demand vending machine, and it’s wonderful. NickelBot is small, but a lot is going on inside. For example, there’s a custom-designed combination engraving platform and hopper that takes care of loading a wooden nickel from a stack, holding it firm while it gets engraved by a laser, then ejects it out a slot once it’s done. 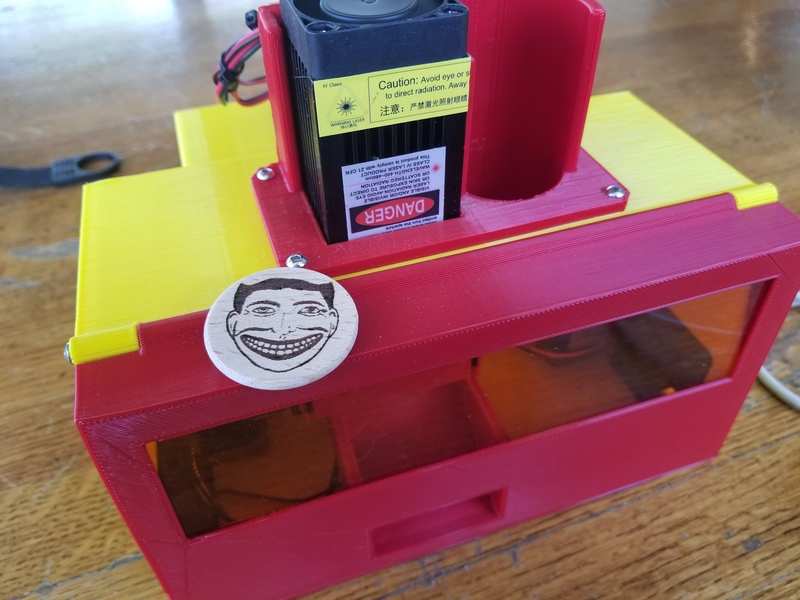 NickelBot is portable and can crank out an engraved nickel within a couple of minutes, nicely fulfilling its role of being able to dish out the small items on demand at events while looking great at the same time. NickelBot’s guts are built around a PSoC5 development board, and LaserGRBL is used on the software side to generate G-code for the engraving itself. Watch it work in the video embedded below. [Helios Labs] recently published version two of their 3D printed fish feeder. The system is designed to feed their fish twice a day. The design consists of nine separate STL files and can be mounted to a planter hanging above a fish tank in an aquaponics system. It probably wouldn’t take much to modify the design to work with a regular fish tank, though. The system is very simple. The unit is primarily a box, or hopper, that holds the fish food. Towards the bottom is a 3D printed auger. The auger is super glued to the gear of a servo. The 9g servo is small and comes with internal limiters that only allow it to rotate about 180 degrees. The servo must be opened up and the limiters must be removed in order to enable a full 360 degree rotation. The servo is controlled by an Arduino, which can be mounted directly to the 3D printed case. The auger is designed in such a way as to prevent the fish food from accidentally entering the electronics compartment. 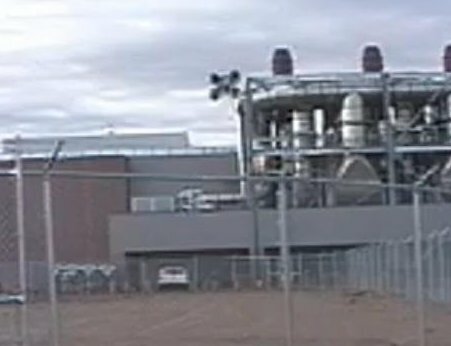 You might think that this project would use a real-time clock chip, or possibly interface with a computer to keep the time. Instead, the code simply feeds the fish one time as soon as it’s plugged in. Then it uses the “delay” function in order to wait a set period of time before feeding the fish a second time. In the example code this is set to 28,800,000 milliseconds, or eight hours. After feeding the fish a second time, the delay function is called again in order to wait until the original starting time. If you’re stuck in the virtual world like [Kevin Flynn] you can still make sure your pup is rewarded for good behavior. Just follow [Jwarp’s] design for this Internet connect dog treat dispenser. We were actually a bit surprised by the demo video. It shows that the compact unit is more than capable of reliably dispensing one treat at a time. It started as a wood prototype which allowed him to tweak how the servo motors worked before laying out all of the 3D parts in Sketch Up. Two motors cooperate to get the job done. The first allows one treat to exit that shoot coming from the center of the hopper. The other stirs the remaining inventory to both position the next treat and loosen any jams. Made by Boston Dynamics under contract from Sandia Labs, this “hopper” is quite incredible as you can see in the video after the break. Boston Dynamics is no stranger to great robotics designs, including the well known “Big Dog” four-legged robot. This robot, although possibly less advanced, has a very unique trick up it’s sleve. This robot’s distinguishing feature is that it can navigate autonomously not only with wheels, but also with a powerful single leg that allows it to jump over obstacles of up to 25 feet. Although envisioned to “deliver a payload” in an urban environment, one could imagine a terrifying horde of these ‘bots jumping into action armed with bombs or other weapons. The days of plugging coins into a stand up arcade game are sadly dwindling. [Dirk] figured out a way to prolong the nostalgia by incorporating currency back into the experience in a useful way. He rebuilt the video game Raiden to pay out a prize when you win the game. Now it takes a coin for each play but if you make it to the end you can recoup the expense. [Dirk] took an original cabinet game, did some dangerous work to replace the old CRT monitor, and retrofit a MAME machine to handle the gaming. He’s using Windows and had some problems because of it but, as you can see after the break, things worked out in the end. 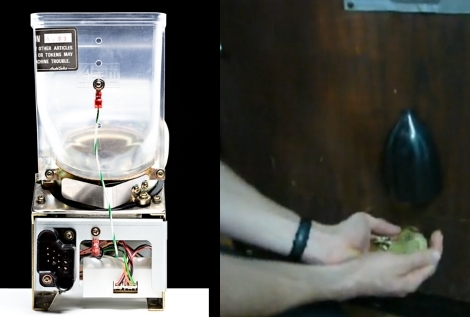 The hopper hardware that spits out coins went through several steps from the initial design to the finished product, but it has always been based around a PIC controller connected to the MAME box via parallel port. This is a fun addition to any MAME cabinet.